Awhile back, I did a review on my all time favorite protein by BioX (you can see it here). I LOVE their Power Whey Isolate. Prior to falling head over heals for Bio X , I was a faithful consumer and supporter of Iso Sensations 93 Isolates and Allmax's Isoflex. 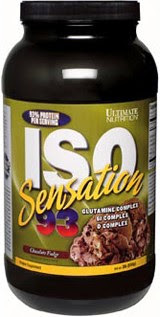 Today I am reviewing Ultimate Nutrition's Iso Sensation 93. 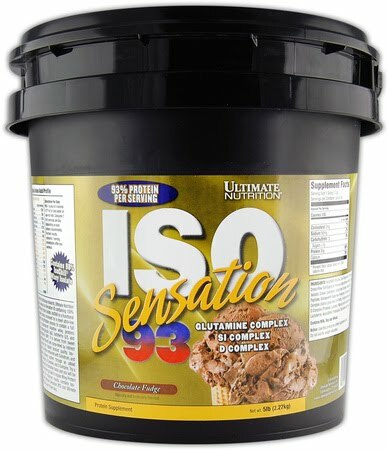 Iso Sensations 93 has a lesser counterpart that is called Whey Sensations 81 . Note that the label or product says WHEY and not ISOLATE. This typically means it is a cheap blend of either concentrate and isolate- or other proteins, or it is 100% whey concentrate. Whey Sensations actually has 81% per serving and is a good cheap basic whey. 30g of protein/ 33g of product. Less protein per serving (because it's not a pure isolate) and therefore has more fat and carbs within the same serving size. 26.8g protein x 4cal/gram = 107.2 cal of the 137 come from protein. As for the percent of protein per serving of this product 26.8 g/ 33g serving size = 81%- much less bang for your buck. Compared to Bio X Power Whey Isolate, Iso Sensations 93 (as are most proteins) is a thinner textured tasting protein. They have a wonderful Chocolate Fudge and Cafe Brazil ! I find that the Chocolate Fudge has a really mild coconut flavor and is wonderful. This flavor is by far my favorite our of their options. I used to love their Cookies and Cream , until I tried Bio X's Cookies and Cream and haven't looked back since! They also have a nice , Strawberry, Natural Natural (no taste, flavor, sweetener etc) Vanilla Bean and a Banana . The stats vary slightly depending on the flavor. This is a FANTASTIC product and recommend it without hesitation. The Chocolate Fudge is really worth trying! Great in Oatmeal, Shakes, eaten as pudding, with nut butters, in Protein Nutella, coffee, ice cream etc. I love the quality, digestibility, taste and effectiveness of this product. As all Isolates, it dissolves almost immediately is a great addition to anyone looking to increase their protein! This supplement contains Glutamine which is really good for body building. It plays key roles in protein metabolism.